The exhibition examines the variety and multiplicity of sources and expression in the work of six artists, all working with abstract geometric forms. Chris Gallagher's optically-charged paintings of parallel bands of color suggest speed, movement and infinite expansion, as if an unseen energy force were propelling the lines beyond the edges of the canvas. 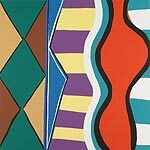 Using lozenge forms, zigzagging lines, crisscrosses and stripes, Kim MacConnel's exuberantly colored and playful abstract pattern paintings are inspired by the figuration of Matisse and Picasso, specifically the latter's images of a woman looking into a mirror. Shari Mendelson's sculptures examine perceptions of the natural world such as the play of light and shadow or the play between solid and transparent surfaces. In one work, triple layers of joined circles of translucent polycarbonate sheeting are suspended from the ceiling; the piece appears to shimmer and dissolve in a kaleidoscopic structure and casts complex shadows against the wall. Ann Pibal works on an intimate scale and meticulously paints repetitive, regular linear elements within zones of flat, smooth color to imply fragments of larger fields. Ambiguously recalling shapes found in nature as well as man-made structures, her lines twist and torque with subtle energy and her colors suggest transitional moments of light, such as dawn or twilight. Jennifer Riley is specifically interested in using the language of geometric abstraction to connote the landscape of the natural world. She stacks irregular lozenge shapes painted in flat bright fields of color along with forms filled with parallel lines to achieve a sense of expansive space. 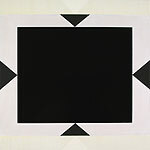 In contrast, Don Voisine's reductive, carefully crafted paintings are inspired by architectural structures. Using bands of color to frame black geometric shapes, Voisine contrasts matte versus glossy surface textures to create a subtle play of movement and perceptual depth.